Dimple Kapadia herself is least interested about the fact that she celebrates her silver jubilee in films this year. Typical of her, she is not at all conscious of the many landmarks in her glorious career. In a telephonic conversation from Mumbai, she says, “What special is there for me to speak about my silver jubilee in cinema. It is just by virtue of the fact that I am still working.” An actress who has stood the test of time by sheer dint of her will power and merit, she remains one of the most under-utilised performers in the past two and a half decades. She won the hearts of the entire nation’s youth with her maiden appearance in Bobby. Her marriage to Rajesh Khanna compelled her to go into hibernation, only to return with a strict determination to prove her talent in the mid-80s. A turbulent marriage taught her many lessons, earlier than required and her second innings saw her appear in films like Saagar, Kaash and Zakhmi Aurat. Dimple admits, “The films you mentioned were not memorable by any means. But my acting abilities were noticed in them. An inner yearning to exhibit my best potential made me switch over from mainstream cinema to parallel films like Drishti, Lekin, Prahar and Rudali. I was able to deliver much more as an actress in these meaningful films.” For Rudali, she won her only National Award as Best Actress. In Pyar Mein, Dimple shares the limelight with Mithun Chakraborty and Rati Agnihotri. She explains, “It is a triangular love story with a positive angle. Hari has given equal footage to Mithunda, Rati and me. I had no problems working with them as they are co-operative co-stars. Mithunda is a seasoned actor and takes care of every actor he is working with. I am very hopeful about Pyar Mein, which will release in July. The film has been shot in Mumbai and Pune. And on the eighth day God invented ice cream! Then man added flavours and sundaes err…Sundays became heavenly! Don’t google the tale, it’s straight from any ice-cream lovers’ heart! There’s even an ice-cream day (as if we needed it!). As for now, the good news? 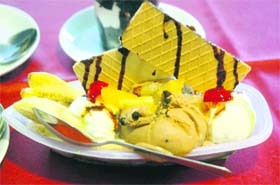 Celebrating the invention is city’s very own Hotel Aroma-22 with ice-cream festival ‘Beat the Heat’. In June summer heat, that sounds like…well, melody! Let’s check out! Their ‘new introductions list’ comprises Fresh Lichi, Coffee Crunch, Cheeku Delight, Roasted Raisins, Pulpy Mango…did you notice? Plain vanilla didn’t even figure on the list! To begin with, Fresh Lichi tastes true to its name while the ones who prefer to close their eyes and guess the subtle taste can go in for Cheeku Delight. The entire range has been done by the in-house team of chefs. A look around and the colourful décor a la balloons as if shriek the arrival of a festival. Says Man Mohan S Kohli, “We are a true blue family place, and especially with the setting up of night food street, the entire student gang including the rowdy ones have kind of deviated towards there.” So will the festivities continue? Anything else on the cards? He says, “After this we plan to come up with a pasta festival and mango festival. Especially watch out for our Mango festival.” That is when that happens, as for now, it sounds too good! Traditions and adventure might make an uncanny combination, but both drive on passion and dedication. And on Sunday morning, the dedication and passion got the best of the Scindia Old Boys Association. SOBA, an alumni association of The Scindia School Gwalior, in association with JK tyres and SAIL, organised a rally to commemorate the 112th Founder’s Day. A flag off from Shivalikview-17 by Gen G. K. Sapru, GOC, Western Command, the event saw over participants decked up for the occasion, ready to roll towards Shimla. In its second year, the 500 kms TSD (time, speed, distance) rally started off from Gwalior to Delhi and then passed through Chandigarh towards its final destination, Shimla. With high spirits and fun behind the wheels, the event challenged the participants on road. “We are driving on public roads, in normal cars not sports versions, and not at break neck speed. So, it’s fun of a different kind since most of us are not professional rallyists,” says Sarabjit Singh Bora who is participating along with his wife Neelam Bora. “This is a fantastic way to celebrate your association with an institution like Scindia and also a quality experience to share with your family. This should be converted into an annual affair,” feels an excited Mahinder Goel from Gwalior. One, two, three, four. Change. Four, three, two, one. Change. And that's all about it. Till some years back, aerobics was limited to those fixed four step exercises. Same movements, same steps, devoid of any fun element, it was just another monotonous way of shedding flab. But that was 'some years back', until the idea of revamping aerobics struck the dance and fitness instructors in the city. Result - now we have aerobics that is a bit of salsa, cha cha cha, bhangra and so many other dance forms. Puneet Jewandah, a dance instructor, endorses this mixing and matching of dance forms, "How else will you make sure that people's interest remains intact in the four step aerobics? All the other dance forms infuse fun in the exercising regime that makes people enjoy it." At her dance studio, we have fitness freaks doing aerobics on the bhangra beats. "It is a high intensity cardio work out that involves a lot of bhangra steps on Punjabi beat. We gradually take the heart beat to the maximum level and maintain it there," informs she. The one-hour non-stop class helps in getting rid of a good number of calories. "One can easily lose 600-700 calories in one session. For some, it is the best form of recreation in a day." The other innovative forms of aerobics that she makes people do is Latin aerobics, cha cha cha and Mambo. The objective is to lose flab, be it through boring exercises or interesting hip-hop cardio workout session. Varun S. Rana is in favour of the latter. "Otherwise, you won't see people exercising with the same enthusiasm they began with. For that reason, we introduce a novel element in every class," he says. The hip-hop aerobics include floor exercises, body isolations and vigourous dance movements. It also teaches one how to shake a leg too. "People don't have enough time to attend two separate sessions on dance and aerobics. Merging the two helps them lose weight and even learn a new dance form. 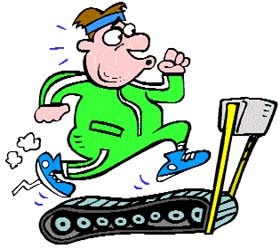 If done in the required way, one can lose up to 5 kg in the first three weeks." The dance studio sees a lot of participation from housewives as well professionals. Soma Kalsi, a dance instructor, feels that people generally prefer aerobics over gymming as there is a lot of variety in these exercises. She says, "Aerobics is no more the same PT exercises we used to do in school. With the introduction of music, it is now entertaining and engaging." Even if aerobics is not mixed with a special dance form, the freestyle dance comes handy. "I give my students the freedom to dance as they want. The only instruction I issue is make faster movements." For those who want tone down through a particular dance form, cha cha cha or hip-hop aerobics is always an option here. If you thought only the Tendulkars and Kumbles were vulnerable to shoulder, and knee injuries, you are mistaken. A growing number of youngsters, particularly the fitness freaks in gyms are the ones increasingly reporting shoulder trouble and knee injuries. "The gym offers so much variety when it comes to exercise, it's tempting to jump in and try it all. But, there are some common mistakes exercisers make that may end up hurting more than helping," says Dr Mandeep Dhillon, head of the orthopedic department, PGI. The best way to prevent injury and prepare for exercise was to do a proper warm-up routine to get blood flowing to the muscles, Dr Dhillon says. Doing calf stretches before a run does not benefit the leg muscles because they are never stretched in the extreme position while running. Almost all over-use injuries are strains that occur when the body is in the normal range of motion and are the result of improper training. If you're short of time, you may be tempted to skip the warm up part and jump right into your workout. But the warm up is one of the most important parts of your exercise routine. By easing into exercise with light movement, you can gradually raise your heart rate, increase oxygen to the body and increase blood flow to the muscles. Ease into cardio: Start with 3-4 days at light-medium intensity until you get used to the workouts. Keep it simple: Even if you used to lift weights, your body needs time to adapt. Start with 8-10 exercises and do one set of 10-12 reps for the first week or so. Rest: If you feel sore, give yourself extra recovery days. You may need a few weeks of consistent exercise to build a strong foundation. For beginners you may need to hold onto the rails at first, but be careful. Holding on puts your body in an unnatural position that could strain the shoulders. It can also affect posture and reduce the calories burned. Straining the knees: When doing squats or lunges, keep the knees behind the toes. Pushing the knees forward puts pressure on the joints and could cause injury. To avoid this, learn proper form for squats and lunges or work with a professional. Rounding the back: When bending over for an exercise, such as dumbbell rows, keep the back flat or slightly arched to protect the back from injury. To make it easier, bend the knees or raise-up until you can keep the back flat. It can be tough choosing the right weights so if you don't have a spotter nearby, it's better to go too light than too heavy. Lifting weights that are too heavy can lead to strained or torn muscles. There are different ways to stretch the body. The most common is static stretching, which involves holding stretches for a period of time to increase flexibility. But, one thing you want to avoid is bouncing while you stretch. When you bounce, you force the muscles beyond their normal range of motion, which can lead to strained muscles or tendons. If you've been doing the same routine for months or years, you're putting stress on the same muscles, joints and connective tissue every time you exercise. This could lead to an overuse injury as well as burnout and boredom. Some common overuse injuries include tendonitis, shin splints and stress fractures. Try cross-training, activities that use different muscles and movements. For example, if you run, try something low or no impact like swimming. Our hunger pangs are activated not by an empty stomach but by fats from the foods we eat to optimise nutrient metabolism and promote the storage of body fat, according to latest research. Ghrelin is a hormone that was believed to accumulate during periods of fasting and is found in the body in high concentrations just before meals. It is dubbed the 'hunger hormone' because it has been shown that administration of therapeutic doses acts in the brain to stimulate hunger and increase food intake in animal models and humans. A new lab study turns the current model about ghrelin (hunger hormone) on its head and point to a novel stomach enzyme (GOAT) responsible for the ghrelin activation that could be targeted in metabolic diseases. Ghrelin requires the addition of a fatty acid by a specific enzyme (ghrelin O-acyl transferase, or GOAT) for activation. Previously, it was assumed that the fatty acids attached to ghrelin by GOAT were produced by the body during fasting. New data unearthed by Matthias Tschöp, a University of Cincinnati (UC) associate professor of internal medicine, and his team suggests that such fatty acids required for ghrelin activation come directly from ingested dietary fats. In a departure from an earlier decade-long model, Tschöp says, the ghrelin system seems to be a lipid sensor in the stomach that informs the brain when calories are available-giving the green light to other calorie-consuming processes such as growing. Tschöp and his team used mouse models to test the effects of over expressing the GOAT enzyme. They found that, when exposed to a lipid-rich diet, mice without GOAT accumulated less fat than normal mice, while those with over-expressed GOAT accumulated more fat mass than normal mice, said an UC release. A poet and novelist of merit and a stalwart in Punjabi literature Mitter Sain Meet is regarded as the first literary exponent of the suffering humanity from the apathy of administration, atrocities of the police and above all, the due justice from judiciary. Born in the sleepy village Bhotna, near Sangrur, Mitter Sain inherited the humility and purity of thought living amidst realities of a pastoral life. Gifted with imagination, Mitter emerged as the youngest writer whose two short stories were published in a leading magazine Bal Sandesh in 1968 while he was still in Class X. He never looked back after that. 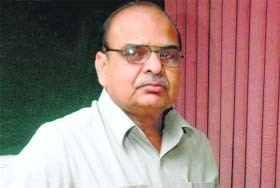 Today, Mitter Sain, the district attorney in Ludhiana, stands tall with over half dozen books to his credit and best known in literary circles in North India for his prestigious Rashtriya Sahitya Akademy award in 2007 for his classic literary creation Sudhar Ghar (Jails). He was felicitated by Manju Jaidka, chairperson on behalf of the Chandigarh Sahitya Akademi on Sunday. Mitter Sain talked about his profession and passion. A novel is a long fictional story about human beings woven around the events of their lives. What are the new dimensions in your writing? Behind all literary creations there exits an emotional urge to express some heart felt experiences. When this urge comes to the surface, the truth is transformed in a suitable paradigm of words. The format may be poetry or novel. Away from the common themes of romanticism and dreaming, I have gathered the courage to bring into focus the socially relevant issues like the administrative laxity in administration and judiciary when it comes to jail reforms. I feel that any form of literature must depict the ethos, aspirations and problems of the suffering humanity. How different is the thematic content and treatment? All my short stories and six novels like Tapteesh, Agg de Beej, Kafila, Kaurav Sabha and Sudhar Ghar have immaculately depicted the evils perpetrated by the ridiculous attitude of the governanc and judiciary. My writings are just the observation of events witnessed during my service as a district attorney and articulation. Being a part of the administrative system you have dared to criticise the governance. Any repercussions? The senior IPS or IAS officers who have read my novels based on factual incidents give credence as these reflect realities close to daily life of law makers and law breakers and also the general public who are always at the receiving end. However, some leaders and terrorist outfits have threatened me after Katehra was published. But since my writings are based on my 18 years of research, it has a substance. The Research and Development wing of the police has even given me an award. Three of my novels have been translated into Hindi, titled as Ram Rajya by the Haryana Police Academy and prescribed as research work. He later indicated that his next novels would bare the rampant corruption in politics, judiciary and the debasing power of money. It's summer, and you know what that means -- vacation time! A time to relax, kick off and let work slip from your mind for a few days. While enjoying your vacation is top priority, it's important to keep your diet on track before you start sipping on your pina colada and ordering that double fudge brownie sundae. Here are some simple tips on how to stay fit while on vacation. Drink lots of water: Hydration is essential while traveling. Water fills you up and never lets you down. And please do skip the free drinks on board if flying. Stay central: Location, location, location. Try to find a hotel with a central location so you can walk to all your destinations. This is a great way to get some exercise and activity in while on vacation. This will give you a good exercise and also give you the opportunity to really see and take in your surroundings. Skip the cab when checking out the sites, and if you plan to go some place for a meal, try walking. It gives you more time to talk and enjoy with your friends and family. Moderation: Vacation is the best time to indulge! But don't overdo it. Try to have dessert every other night. Or, why not share that dessert. It cuts the calories in half. Vacations should be a time for enjoyment and letting loose a little while still keeping your self on track. Cut back: Alcohol and caffeinated beverages can be extremely dehydrating, especially in hot weather climates. You don't have to ban it, but don't binge on it either. A good trick is to have a cup of water for each cocktail or caffeinated beverag you consume; this will help keep you hydrated. Healthy breakfast: Start the day with something nutritious to eat. This will give you the energy to begin the day and help keep your metabolism going. Quick bites like bananas, yogurt, whole-wheat bagel, cereal are good options .Though the croissants and muffins are tempting, try to keep breakfast as healthy as possible. Take a dip: If your destination brings you close to a beach or a pool, take a dip and get some exercise while you're at it. If swimming isn't your thing, take a stroll on the beach or play some beach volleyball. Stretch it out: Give yourself a quick stretch in the morning to get your muscles a head start for the day. Have fun: Enjoy your vacation. Laughing does burn calories, you know. With Sajid Nadiawala's multi-million budgeted movie Kambakkht Ishq ready to hit the screens on July 10, Bollywood actor Akshay Kumar is keeping his fingers crossed. The star had two successive flops this year after a dream run since 2006 during which his films raked up over Rs 500 crore business world-wide. His latest releases Chandni Chowk to China and Tasveer 8x10 have not done well. Now, after a two months of lull and producers-multiplexes row over revenue sharing being resolved amicably, Kambakkht Ishq is the first big budgeted film to be released next month. Talking to reporters here, Akshay said he is keeping his fingers crossed and hoped that his new film directed by debutant Sabbir Khan does well at the box office. He said his success ratio with new directors has been very good. "I worked with new directors like Abbas-Mustan, Vipul Shah, Sajid Khan and the films did phenomenal business," he said. Kambakkht Ishq is not an action film, he said. "It is a romantic comedy. I am doing a romantic film after a long time. The film is technically very superior," he said. Speaking about his interaction with Hollywood superstar Sylester Stallone, Akshay said they discussed how action sequences are picturised in Hollywood and Bollywood. "We also spoke about health problems suffered by action stars. He told me about his knee problem," Akshay said. Akshay said he played a male chauvnist in Kambakkht Ishq. The actor said the truth is women are more powerful and have more guts than men. "I have just completed television series Fear Factor season two with 13 women," he said. Saying that he was relieved that the multiplex-producers deadlock over revenue sharing has been resolved, Akshay said there would be a beeline of films waiting to be released. "Myself and the industry are positive and I want every film to do well. All losses will be recovered in three to four months," he said. Akshay's co-star Kareena Kapoor said Kambakkht Ishq takes style and fashion to another level. "My character has a understated classic look," she said. Bollywood veteran Manoj Kumar is upbeat about donning the director's hat once again in his golden jubilee year in the industry for an 'Indo-Pak' love story. The actor-turned-filmmaker may have moved on from the Om Shanti Om controversy, but maintains that what Shah Rukh Khan did was ‘dirty’. "Though I had three subjects in mind, I decided to first go with Indo-Pak: A Love Story. The film will not revolve only around patriotism. It will have a human and romantic angle," Manoj Kumar told. "The film will highlight that there is a lot of commonalities between the two countries. We have the same features, our food is similar and, after all, a few years ago we were one single country," said the 71-year-old actor, who was known as 'Mr. Bharat' for his patriotic films like Upkaar, Shaheed and Purab Aur Paschim. Manoj Kumar said he chose such a theme as he was born in Abbottabad, a town of the North West Frontier Province now located in Pakistan, adding that he would take a few Pakistani actors for the film. "I was inclined to this subject since I have lived in Pakistan and now am living in India. I know the cultures of both the countries," he explained. He is donning the director's mantle after 1999 when he made Jai Hind. Asked if he still had any grudges against superstar Shah Rukh for the spoof on him in Farah Khan's 2007 film Om Shanti Om, he said he had moved on but asserted that what Shah Rukh had done was wrong. "Shah Rukh did a dirty thing. When I reacted he then visited me, apologised and said he will remove the scene from the film, but he did not keep his promise. It was not that I get angry with people on everything, but I have to protect the image of Manoj Kumar. Later when he removed the scene, I dropped the matter," Manoj Kumar said. "It's been two years and now I don't have any grudges against him. He is just like a younger brother to me," he added. Manoj Kumar had objected to the spoof on him in Om Shanti Om and filed a lawsuit to get the scenes deleted, but the issue was later settled out of court. Manoj Kumar said he would like to cast new faces in his new venture though he likes Aamir Khan best among the current lot of heroes. "I like Aamir's work and I'm particularly happy that he is doing less and only meaningful work, but for my film I want fresh faces," the Padma Shri awardee said. "I am negotiating with a few actors, but nothing is confirmed as of now. I have decided to take one or two actors from Pakistan for the film," he said. Asked if he would like to act in his film or take up other acting assignments, the yesteryears actor said: "I will never impose myself on a script. If there is a suitable role for me in a film, then I will do it; otherwise I won't push myself into it." Katie Holmes has lashed out at ‘spiteful’ rumours claiming that her marriage to Tom Cruise is on the rocks, insisting that ‘enough is enough’. The 30-year-old actress declared: "Some of the stuff people have said is absolutely horrible. It is so disgusting and uncalled for." Last week, Hollywood rumour mill went into overdrive after an American magazine and internet stories claimed that the two-and-a-half year marriage is in turmoil and the couple are heading for divorce. However, Katie - who has just finished a new film, a comedy called The Extra Man and her stint in New York - is now back home in the couple's Beverly Hills mansion with Cruise, 46, and Suri. In a rare interview Katie told: "We're all together. We like to be together, so Tom and I even use the house for our business meetings. "We play board games like Yahtzee and Scrabble. We grill, we have pool parties, we play the Three Little Pigs and Suri is the Big Bad Wolf. Tom reads storybooks to Suri and we all laugh. Michael Jackson, who hasn't been seen without a veil in the recent past, let his guard down to allow the world a rare glimpse of him and his kids. Prince Michael I, 12, and Paris, 11, were seen without their customary masks as they joined their father at a Los Angeles recording studio without any veil. But when they left the premises two hours later, they were wearing their masks again. 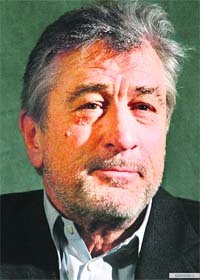 Hollywood legend Robert De Niro was accosted by a drunk female fan on the set of his new film Stone in Michigan. The star was shooting Stone with fellow actor Edward Norton Friday when production had to be halted as a drunk woman barged on the sets. She managed to bypass security. The woman, named by TMZ.com as Carlyn Campbell, allegedly accosted De Niro before police were called to remove her. Campbell was later admitted to a local hospital. Babies need love and stimulation in their first year or risk poor brain development and social skills, a leading child health expert has warned. Dr Cheryl Power, a clinical psychologist, says infants of mothers with mental health difficulties could be at risk. This is so because health experts often focus on the problems of the mother, making the infant 'invisible'. Power believes this isolated approach could have a damaging effect on babies' health.